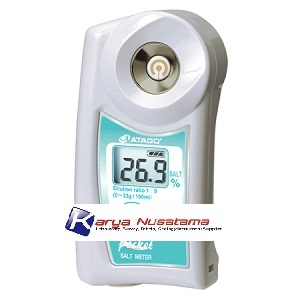 Hubungi Kami 085740767348 / Wa 081339893673 untuk pemesanan Atago PAL ES3 Hand Held Digital Salt Meter di Malang. kami supplier dan distributor alat safety, alat ukur, alat teknik, alat survey, laboratory dll. The new “Pocket” Salt-meter PAL-ES3 is suitable for inspections carried during the manufacturing process as well as for quality control at food factories. It is the best for the measuring the % concentration of salt in sauces, catsups, seasoning, and soups. The displayed unit is in g/100ml as in the Mohr’s method.